Sometimes I just do not have time to connect to the internet and check current weather conditions. 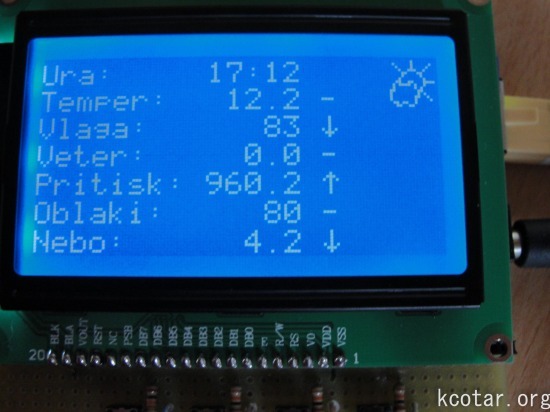 This is the reason why I made this indoor LCD weather display based on Atmega328 Arduino MCU. 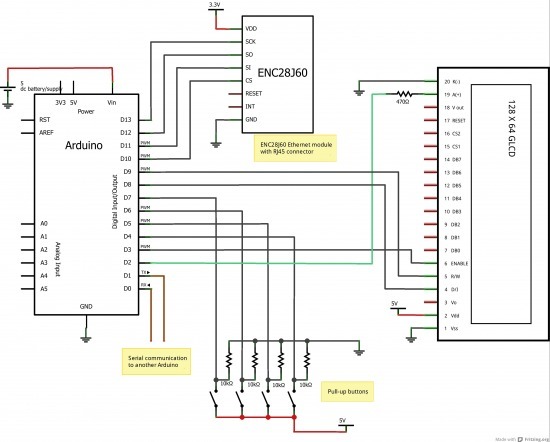 The circuit board consists of two LP2950 voltage regulators, MCU, four buttons, ENC28J60 Ethernet module and LCD12864 graphic display module.The Ethernet module is used to connect to this website and to download current data. With it I am not limited to use only at home, but it can be used in any place with internet access. The input voltage is 3V3 so this is the reason why I have two voltage regulators. The connection to MCU is established using SCK, MISO, MIMO and SS digital pins. Indoor weather station display disassembled. 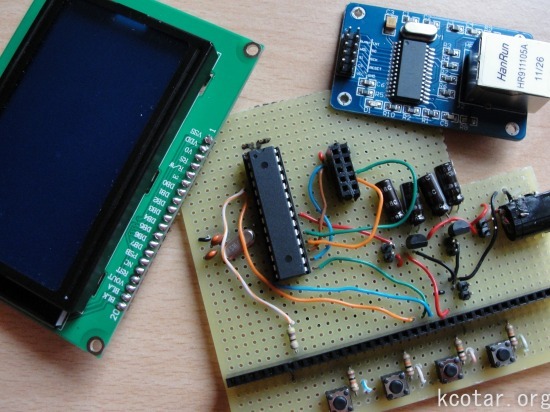 The LCD12864 display uses ST7920 controller that has the option of parallel and serial communication. Serial communication is preferred because it uses only three digital pins (3, 8 and 9) instead of ten or more for parallel. Another advantage with this display is that it can be used in graphic mode. With it you can control individual pixels on screen. I used this to draw the sun or clouds depending on a outside conditions. Display showing the current data. LCD display in action. On the first screen you can see the current weather data (temperature, humidity, wind pressure, cloud coverage and sky temperature), the time when they were recorded and if the change from earlier time is positive, negative or constant. On the second picture the display is showing maximum and minimum within certain period and they can even be reset. All the captions are in Slovene language. More pictures can be found in gallery. Display showing the limiting data. The original library was meant to be used with Arduino Mega that has 4 times as much SRAM as ATmega328 I have been using. The screen buffer alone needs 1KB (128×64/8 = 1024 bytes) of memory that is half of the total memory one could use. Beside this in graphic mode you have to store every individual pixel of any character used, leading to overflown memory, leading to broken code and unexpected errors. If you do not want to change the look of the character while the program is running you can store them in FLASH memory along with the source code. Any variable the contents of which will be constant and not changed after initialization can be stored in FLASH using avr/pgmspace library. Doing so updated library can be successfully used on UNO an Duemilanove Arduino broads. Here you can download my updated version of the library I have been using for LCD 128×64.